I'm preparing a series of plots for publication, but one of my primary intended readers happens to be color-blind. I like to use the printer's traditional red in addition to black as a second color, but I have never really found out if my reader can "see the difference" or not. My question is: is there an accepted set of colors which combine sensitivity to this particular disability without sacrificing the maximum legibility and impact that one can achieve with the black/red(/third color?) combination? There are several kinds of colorblindness, so which colors stand out more depend on which kind of colorblindness is being discussed. One of my colleagues had a former employee who was red-green colorblind, and he said that blue was very vibrant for him where red and green were not. But that's just one report. Although there are several forms of colour blindness, as Aaron Priven noted, the inability to distinguish red from green (red/green colour blindness, natch) is the most common condition. Probably around 5% of men in North America are red/green colour blind (compared to less than 1% of women). So that means the main thing you want to avoid is colour coding with red and green. In addition to blue, yellow is the other colour that red/green colour colour blind individuals can distinguish very reliably. I have acute RG color blindness. I can differentiate blue/cyan, red/magenta all from black, and blue/cyan from red/magenta. Blue is good, but yellow only works if there is a background wash. In many cases, yellow is too thin on a white background. I find I cannot differentiate multivariate series in Excel, as MS frequently uses colors around red and green. BTW, Color blindness is recessive, carried on the x gene. I would expect the frequency in women to be the square of the frequency in men. Helen Varley's book Colour (ISBN 0 86134 024 8) Marshall Editions, London 1980 has four reproductions on pages 38 & 39 of how the standard London Underground map looks to sufferers of the various combinations of colour blindness. The National Cancer Institute provides several guide lines relating to web design and usability. Their guidelines are evidence based, graded and referenced. The particular guideline relating to colour can be found here. Web forms are big problem for me. Many forms use black text for the field labels, and once submitted, highlight errors in red. On a white background, red text looks close to black text, and I have to carefully scrutinize the form to figure out what the problem is. As I work on the website for our school, I find some of the previously mentioned sources very helpful. One of them (Visibone?) said something like "Vision is very complicated." and I agree. It is an interesting and large topic of study. One thing I didn't see mentioned, perhaps because it is very rare, is achromatopsia or true colorblindness. What most people are referring to is one of the color deficiencies. My son has achromatopsia and sees red and black as nearly identical and hard to distinguish. Achromats deal with a bigger issue: their photophobia and lack of visual acuity. They often use enlargement software that allow them to change colors, size, and contrast. Cynthia A. 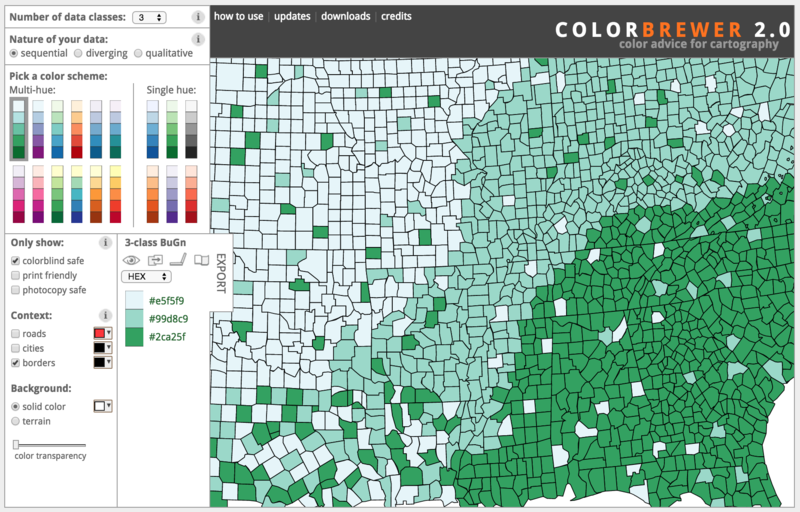 Brewer has done a lot of great work on cartography and color and even has an online application for generating map color schemes that are "color blind friendly." Check out ColorBrewer2.0 here. Some color-contrast tools are lists here. Among the tools listed is the Color Contrast Analyzer, a PhotoShop filter that simulates various colorblindness conditions, and a standalone tool that can show you if your colors will work. I've found this resource on Color Universal Design (CUD) to be very useful, by two Japanese researchers (Masataka Okabe and Kei Ito) who are both strong protanopes. 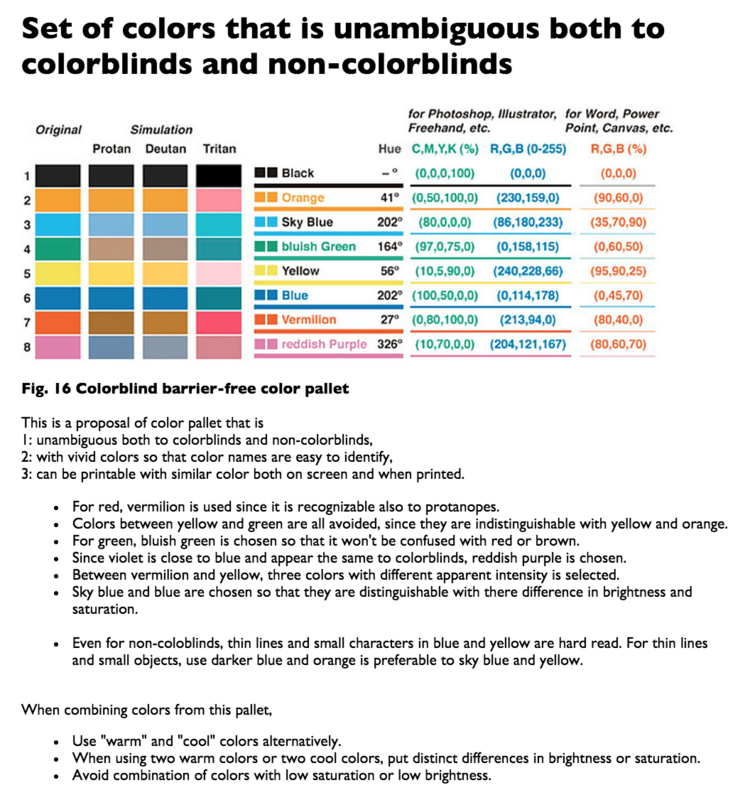 It's a comprehensive guide to color blindness, and ways to avoid problems in presentations and publications, including a set of palettes with instructions on how to import these into several graphical programs, office etc.